About the first thing I saw on the morning of my arrival in Petrograd . . . was a group of young men, about twenty in number, I should think, marching through the street in front of my hotel, carrying a scarlet banner with an inscription in large white letters. “What does that banner say?” I asked the hotel commissionaire who stood beside me. “It says ‘All the Power to the Soviet’,” was the answer. Judging from this passage, most of us would assume that Dorr arrived in Russia after the October Revolution, since only then did the soviets overthrow the Provisional Government. But Dorr came to Russia in late May 1917 and left the country by the end of August. Her book was sent to press before the October Revolution and thus gives us an invaluable look at what was happening in 1917, free of hindsight. Try to imagine how it would be in Washington, in the office of the secretary of the treasury, let us say, if a committee of the American Federation of Labor should walk in and say: “We have come to control you. Produce your books and all your confidential papers.” This is what happens to cabinet ministers in Russia, and will continue until they succeed in forming a government responsible only to the electorate, and not a slave to the Council of Workmen’s and Soldiers’ Delegates. Dorr’s account is one-sided: soviet power was strongly contested throughout 1917 and the Provisional Government had its own ambitious agenda. Nevertheless, she brings out realities that won’t be surprising to most historians but that cast an unexpected light on the slogan “All Power to the Soviets!”. It’s worth exploring this new perspective, first by demonstrating the continuity between February and October, then by asking what kind of revolution this was, and finally by looking at the leadership of the Bolsheviks and Lenin in particular. Another Russian word — vlast — presents more of a challenge. “Power” is not an entirely adequate translation for a variety of reasons. Vlast has a more specific reference than the English word “power,” namely, the sovereign authority in a particular country. In order to have the vlast, one has to have the right of making a final decision, to be capable of making the decisions and of seeing that they are carried out. Often, in English, in an attempt to catch these nuances, vlast is translated by the un-idiomatic phrase “the power.” I will use “power” and vlast interchangeably. Overlooked is the strong continuity between February and October. Right from its beginnings in February, the upheaval in 1917 should be seen as an anti-bourgeois democratic revolution. Soviet power was actually proclaimed in February — the role of October was to confirm that it would not leave the scene peaceably. The basic force behind this new power or sovereign authority — the soviet constituency — was the people, the narod, the workers, soldiers, and peasants, the mob; as opposed to the elite, the tsenzoviki (“census people,” the propertied classes), educated society. The central aim of the soviet revolution was to carry out the vast program of reforms earlier denoted by the term “democratic revolution” — first and foremost, land to the peasants and liquidation of the pomeshchiki (gentry landowners) as a class and also to end a murderous and pointless war. At the same time, the revolution was intensely anti-bourgeois, even if this feeling did not translate into a programmatic demand to install socialism in the short or middle term. The surprising fact is not the social base of the revolution nor the anti-bourgeois values of this base, but rather the creation almost simultaneously after the fall of the tsar of a viable candidate for sovereign authority in the land that relied on this broad popular constituency. The tsarist vlast that had ruled Russia for hundreds of years collapsed in the capital city of Petrograd. Tsarism had been a vlast in the full sense of the word: it had control over the armed forces, a strong sense of legitimacy and mission, and a social base. The Petrograd Soviet was created by socialist intellectuals who called for representatives from the factories and, very quickly, the soldiers. Soon, the famous Order Number One issued by the soviet gave it the most indispensable quality of a vlast: control over the armed forces. By calling for democratization and formation of soldier committees, the Petrograd Soviet earned the soldiers’ loyalty and trust. The Provisional Government was formed by liberal elite politicians. Though the Provisional Government tried to claim some sort of legitimacy from continuity and legal transmission of power, it essentially represented a reaction to the creation of the soviet. Thus, from the very beginning, the elite classes were thrown off balance, faced with an unexpected obstacle in the form of a functioning soviet vlast. Luckily for it, the Provisional Government found allies in the soviet’s moderate socialist leadership, who felt it was imperative to keep the more progressive elite elements on the side of the revolution. Thus the Petrograd Soviet took on the role of the ultimate source of the vlast, the sovereign authority — though at this stage it was still careful not to take the name. The soviet was the elected representative of the workers and the soldiers: an essential difference from its 1905 incarnation. There were two fundamental moments in this assertion of authority: first, the Provisional Government was forced to commit itself to key parts of the Soviet program in order to gain elementary legitimacy, and indeed, in order to come into existence. Second, Order Number One allowed the soviet (almost without noticing it) to gain an essential attribute of any vlast, namely, control over the ultimate means of coercion, the army. These two facts — government commitment to carrying out key parts of the soviet program and the ultimate loyalty of the armed forces to the soviet rather than the Provisional Government — determined the course of politics for the rest of the year. On the surface, the vicissitudes of soviet power during the course of 1917 found expression in a series of dramatic political crises. Underneath, a more molecular process was taking place that clothed the soviet with the essential attributes of a genuine vlast. Let us take a look at this deeper process. A sense of mission — what we might call inner legitimacy. A plausible, loyalty-inducing claim of legitimacy — outer legitimacy. A monopoly of the legitimate means of coercion. Ability to eliminate all rivals. A wide-ranging program for tackling the essential national problems of the day. An administrative apparatus capable of transmitting the will of the central vlast across the country. These are the key features of a functioning vlast. The embryonic soviet vlast established in February started off with some of these features in virtual form, and then these and all the other features steadily acquired more substance, first in 1917 and then during the civil war. For example, the soviet gained a national institutional form, through an all-Russian conference in late March and two congresses of soviets (June and October). In contrast, the Provisional Government progressively lost even those essential features with which they started, so that it became more and more spectral. By the fall of 1917, it had lost the support of even moderate soviet leaders and was no more than a phantom vlast. We turn now to the unbroken series of political crises that marked the relations of the soviets and the elite reformers in the Provisional Government. The political struggle in 1917 was conducted within an unwritten constitution that stated that the soviet majority has the final say on matters of program and personnel. Right at the beginning, Alexander Kerensky was inserted into the government as a soviet representative. For this and other reasons, the contrast often made between an initial period of “dual power” and a later coalition period is inessential. In early May, the Provisional Government proposed but the soviet disposed — it agreed to the government’s request to send more representatives into the government. No matter how many individual representatives the soviets sent to the government, the fact remains that no major policy initiative was carried out against the explicit wishes of the soviet majority. Thus the various political crises that arose through the year all ended when the soviet authority made its will known, since it had ultimate control over coercive force. This was true in March, April, July, and August, as well as October. Of course, soviet power was strongly contested from the beginning: the counterrevolution also had its origin in February. The key source of conflict was over what was called at the time the krizis vlasti, the crisis of power. The issue was often framed as follows: dvoevlastie, dual power, dual sovereignty, is a contradiction in terms — if the buck stops here and over there, then who makes the ultimate decision, the one that really counts? Thus “dual power” is the equivalent of “multiple power” which is the equivalent of no vlast at all: a recipe for governmental dysfunction. Russia needs one undisputed, recognized, and tough-minded (tverdaia) vlast. At this point, opinions began to differ. The liberal Kadet party, the first ones to bring up this line of thought, said that therefore the soviets must retire from the scene. The Bolsheviks, who quickly picked up on this argument for their own purposes, said that therefore all power must go to the soviets! The existential question facing the soviet constituency was: could the soviet program be carried out by means of a good faith partnership with elite reformers — or was the gap between elite and narod on such fundamental questions as the war, the land issue, and economic regulation too wide to be bridged? The Bolsheviks labeled the attempt at cross-class partnership as soglashatelstvo — a term often misleadingly translated as “conciliation,” but which can be rendered in English in a more straightforward way as “agreementism.” So the question before the soviet constituency was: is agreementism viable? Yes, it may be convenient to work with the elite rather than against it, but not if it means giving up on the aims of the revolution. From the point of view of the incipient counterrevolution, there were two possible strategies for eliminating the soviet system: a hard coup or a soft coup. An attempt at a hard coup was made by General Kornilov in late August — but this was a misbegotten adventure from the beginning, one that quickly ran up against the hard fact of politics in 1917, namely, the ultimate loyalty of the armed forces to the soviets. The soft coup relied on a different strategy of creating by various means an alternative wide-ranging vlast with national support, all the while asking the soviets to voluntarily bow out. Under this category comes such experiments in the fall as the Democratic Conference and the Pre-Parliament. More and more, the Constituent Assembly became the centerpiece of attempts at a soft coup, that is, of inducing soviet power to bow out gracefully. For the soviet constituency, the question was decided by early September, when new majorities in the soviets of Moscow and Petersburg showed their support for an all-soviet, anti-agreementist government. It became evident that the forthcoming Second Congress of Soviets in October would take the same line. So the question became: would the unwritten constitution hold? Would the new soviet majority be able to exercise the same ultimate control over the policies and personnel of the government that the old soviet majority did? In the usual telling, October was the time when the soviets overthrew the Provisional Government. From our perspective, it was the time the Provisional Government failed to overthrow the soviets. At the same time, the soviets assigned political leadership to the Bolshevik Party. This choice was an inevitable implication of the more fundamental decision to keep soviet power in existence, since the Bolsheviks were the only organized political force willing and able to do this. (The Left Socialist-Revolutionaries [SRs] were willing enough, but barely even an organized political force.) The dissolution of the Constituent Assembly in early January ended the last chance to end soviet power peacefully, that is, through voluntary self-dissolution. Thereafter the question was settled on the fields of battle. According to the unwritten constitution, a regularly elected Congress of Soviets representing soviets all across the country had the right and duty to determine both the personnel and the policies of the revolutionary government. The Second Congress that met on October 25 and 26 was just such a body. We often get so fascinated by the dramatic debates among the Bolsheviks, and by the “armed uprising” organized by the Petrograd Soviet’s Military Revolutionary Committee, that we tend to forget that the basic political fact in the autumn of 1917 was the new majority that had formed nationwide among the soviet constituency. Accordingly, a look at the proceedings of the Second Congress will give us some idea of the meaning of October in October — that is, what the Second Congress as a whole, including both its majority and minority, thought it was doing. According to the unwritten constitution, a properly constituted Congress of Soviets had the right to determine the government’s personnel and policies. This was the heart of the matter, and no one at the Congress disputed it, not even the Bolsheviks’ most determined enemies. Instead, they tried to undermine the Congress’s legitimate status by various other means: First, by using walkouts to deprive the Congress of its necessary quorum and turn it into a “private conference.” Second, by claiming that armed conflict and “civil war” on the streets made the work of the Congress impossible. But note: the anti-Bolshevik socialists did not protest the arrest of the Provisional Government, but only the treatment of the socialist ministers — and even here the outrage was not caused by their status as ministers, but rather because they were party comrades on a party mission. Finally, even while granting that the Congress had a right to create a new government and even a government that excluded any non-soviet parties, they insisted that this new soviet vlast represent all soviet parties and even all democratic forces — thus the Martov wing of the Mensheviks and the Left SRs, though the creation of such a wide coalition was an unrealistic pipe dream. Thus no one at the Congress really contested the unwritten constitution. In his original draft, Lenin had written “Long live socialism!” but he crossed this phrase out. This fact points to another feature of the debates at the Congress: the low profile of “socialism,” as either word or concept. True, mention can be found of socialism as the final goal. But the Bolsheviks never defended the actual program set out by the Congress as a socialist one — nor, most revealingly, did those who attacked the Bolsheviks make any critique of unrealistic attempts to install socialism in Russia. “Socialism” was simply a non-issue at the Second Congress. The historic meaning of the Second Congress, then, was that the previously unwritten constitution now openly affirmed itself as the ultimate law of the land. The embryonic vlast created in February — a vlast based solidly on the workers and peasants, and dedicated to the program of the revolution — announced to the world its firm intention to survive and thrive. Our look at the Second Congress and its program makes unavoidable the question: what kind of revolution was the Russian Revolution of 1917? In some ways, of course, a worker-peasant revolution in Russia would inevitably be “socialist,” that is, it would be led by committed socialists whose ultimate aim was to establish a socialist society. Socialist parties had an absolute monopoly of political loyalty from the narod and none but socialist parties were ever represented in the soviet system. Furthermore, the Bolsheviks finally placed their project in the context of the Europe-wide socialist revolution that they believed was in the offing. On the other hand, when we look at the actual program for Russia adopted by soviet power in 1917, and also at the actual message sent out by the Bolsheviks day in and day out to the soviet constituency, we will find that “democratic” demands crowded out “socialist” ones almost completely. The binary contrast between “bourgeois-democratic revolution” and “socialist revolution” goes a long way back in the Marxist tradition, but by the early twentieth century it was showing definite signs of strain. In 1906, Karl Kautsky wrote a seminal article entitled “Driving Forces and Prospects of the Russian Revolution.” This article delighted Lenin, Trotsky, and Stalin, all of whom wrote commentaries on it. Even after the 1917 revolution, Kautsky’s article was endorsed by Lenin, Trotsky, and even Karl Radek as a classic exposition of the logic behind Bolshevik revolutionary strategy. Here Kautsky made the argument that Russia was undergoing “neither a bourgeois revolution in the traditional sense nor a socialist one but a quite unique process which is taking place on the borderline between bourgeois and socialist society.” For Kautsky, the once and future Russian revolution was not bourgeois, because it was led by socialists, but it was also not socialist because the peasant allies of the proletariat were not ready for socialism. All Russian Social Democrats (including Trotsky) agreed that Russia’s peasant majority was a barrier to socialist transformation, absent a game-changing European revolution. Given this, it seems all the more apt to understand the 1917 revolution as an anti-bourgeois democratic revolution. The revolution that created and defended soviet power was democratic both in terms of its class content and its program. The Petrograd Soviet was created by the workers and soldiers of the capital city — that is, soviet power was a “worker-peasant vlast” from the very beginning and it never lost this character. By the rules of Marxist discourse accepted by everybody in 1917, a revolution that embodied the interests of the peasantry was thereby a democratic one. As we have seen, the soviet revolution was also democratic in its program in 1917. There is an idea among many Marxists today that proclaiming “the socialist character of the revolution” was a logical necessity for the project of soviet power to make sense. This idea wilts under inspection — and indeed it was forcefully refuted in 1917 by Lenin and Trotsky themselves. There is also perhaps a tendency among some Marxists today to look down on a “merely” democratic revolution as one restricted to paltry reforms and a measly “minimum program.” The Bolsheviks had a very different attitude. They saw the democratic transformation of Russia — creation of a radical democracy, land to the peasants, liquidation of the landowning gentry as a class, and modernization of all spheres of life — as a highly ambitious and rewarding mission. Furthermore, it was one that only committed socialists could carry out. Which brings us to the second part of our definition: in contrast to the classical “bourgeois-democratic revolutions,” the Russian revolution was anti-bourgeois from the very start. First, for the reason noted by Kautsky: it was led by socialists and not by liberals or “bourgeois” of any stripe. Second, both wings of the soviet constituency — workers and peasants — were thoroughly hostile to the burzhui and to bourgeois values. Third, the Russian Revolution took place amid an accelerating breakdown of any workable market system. From the beginning — that is, from February — the soviet constituency was hostile to the burzhui both in its narrow meaning of industrial owners and in its wider meaning of the tsenzoviki (an abusive word for the educated elite that derived from the property requirements or “census” that restricted the number of voters), the beloruchki (the ones with white hands), and other unfriendly terms for the educated elite. Even in the early days, when hopes were high for a real partnership, the burzhui were regarded with suspicion and, indeed, with an automatic assumption of insincerity. Commitment in a positive way to socialist institutions was much less powerful than a negative attitude toward the bourgeois as individuals as well as toward bourgeois values. The anti-bourgeois drive arises organically out of the very fact of soviet power, not just the dreams of socialist intellectuals. Anything like a bourgeois class, market institutions, and middle-class values were destroyed by the Russian “time of troubles” starting in 1914, and there was no social or political will to reconstitute them. Thus, socialism in the Soviet Union acquired content by the drive to make a great modern country work without a bourgeoisie, or an autonomous market, or bourgeois pluralism. Both the short-term social dynamics and the long-term economic result of the revolution were determined in the first place by the anti-bourgeois drive of the soviet constituency. To understand why it was the Bolsheviks and no other party that was given leadership by soviet power, we have to take a broader view and look at the so-called hegemony strategy that defined Bolshevism before 1917. “Hegemony” is a word with many meanings in many different contexts. When the Bolsheviks used it to sum up their view of class dynamics in Russia, they meant first and foremost that the socialist proletariat would act as leader (hegemon) for the peasants. In a fuller formulation: the socialist proletariat would carry out the revolution “to the end” by creating a revolutionary vlast based on the common interest of the workers and peasants, and by rejecting any bid by liberal reformers to halt or turn back the revolution. The prewar hegemony strategy gave the Bolsheviks a head start — a blueprint that led eventually to majority support at the Second Congress. The Bolsheviks in Petrograd did not need Lenin to size up the situation and to set their sights on winning over the soviet constituency — both workers and peasant soldiers — to the project of full soviet power and to persuade them to reject any agreementism with elite reformers. Bolshevik leaders such as Kamenev and Stalin were confident that the Provisional Government would be utterly unable to carry out the revolutionary program and indeed would quickly reveal its counterrevolutionary essence. In all of this, the role of the peasant ally remained the heart of the matter. Most of the discussion among Bolsheviks in April after Lenin’s return was devoted to ensuring that everybody was on the same page about the crucial revolutionary role of the peasants. This is why some Bolsheviks insisted that “the bourgeois-democratic revolution is not finished” — this was another way of saying “the peasant is still a revolutionary ally.” Lenin responded by underlining that any so-called “steps toward socialism” (for example, bank nationalization) could only be undertaken with peasant understanding and support. Over the whole course of the civil war, the middle peasantry did not go along with the proletariat with a firm tread. It wavered more than once, especially when faced with new conditions and new burdens; more than once it moved in the direction of its own class enemies. [But] the worker/peasant state, built on the foundation of an alliance of the proletariat with 80 percent of the peasantry, by this fact alone cannot have any competitors for the vlast inside the boundaries of Russia. But the idea of Bolshevik communism is so alien and even hostile to the mindset of the peasant Red Army, that he can neither be infected by it himself, nor can he infect others with it. He cannot be attracted by the idea of war to convert capitalist society into communist society, and this is the limit of the Red Army’s potential for the Bolsheviks. Dan had a strange understanding of “the idea of Bolshevik communism.” Nevertheless, his remarks bring out two central points about the Russian Revolution. First, it was strong when it was compatible with peasant interests, and weak when it strayed beyond those limits. Second (a point obscured by Dan), the peasants could hardly have constituted an effective fighting force unless they had been given political leadership by a political party based on the urban branch of the narod. The Bolsheviks were thoroughly committed to a worker-peasant alliance and ipso facto to an essentially “democratic” revolution. Only in his last articles did Lenin explicitly advance the idea that the proletariat could lead the peasant majority all the way to socialism. In some ways, this outlook was a break with the original version of hegemony, but more profoundly, it was just a further extension of the core idea of socialists leading peasants. In October, the leadership of soviet power was entrusted to the Bolshevik Party. Looking at events from this point of view prompts a new look at Lenin’s leadership within the party, one that brings out some unexpected features. But we must start with the fact that Lenin was primarily responsible for elaborating and defending the hegemony strategy before and after the 1905 revolution. In October 1915, he sharpened his scenario by suggesting that a worker/peasant vlast would take power during the second stage of the revolution, replacing an anti-tsarist but defencist regime. He thus provided the party with its basic strategic orientation. When Lenin returned in April after a decade in emigration, there was great potential for discord and demoralization. What is striking about Lenin in April — after we look in detail at the give-and-take among the Bolsheviks — is his ability to listen to his party comrades, sort out what was primary and what was secondary, and help clear up misunderstandings, both on his part and on the part of the Petrograd Bolsheviks. Let me give one small but revealing example of Lenin’s learning from the locals. In his “Letter from Afar” that he sent from Switzerland before returning, Lenin continually referred to the “Soviet of Worker Deputies.” When they printed his article in Pravda, the editors silently changed each occurrence of this phrase to the correct title “Soviet of Worker and Soldier Deputies.” In the original text of his April Theses, delivered immediately after his return, Lenin still used the inaccurate shorter title. Alerted by his comrades to the problem, he immediately switched over to a title that was an important symbol of the foundational peasant-worker alliance. Lenin also deserves credit for the adoption of the famous three-word slogan “All Power to the Soviets!” but in an unexpected way. The slogan does not appear either in the April Theses or in the resolutions of the party conference that ended on April 29. Its first recorded use seems to be on a banner that was carried in the streets on April 21 during antigovernment demonstrations. Lenin noted its appearance and later quoted it in a Pravda article on May 2. The first use of the slogan, not just on an anonymous banner or in a signed article by an individual but in an authoritative party document, occurs in Pravda on May 7. Thus Lenin was perspicacious enough to observe the slogan and note its possibilities. On present evidence, it was indeed Lenin who lifted it out of anonymity and made it central to Bolshevik agitation. After the July Days, Lenin thought that the unwritten constitution had been abrogated and that the current soviet system was no longer capable of exercising power. He therefore wanted to retract the slogan “All Power to the Soviets!” As he later admitted, this was a leftist deviation. Luckily, other party leaders managed to keep the slogan intact, and this served the Bolsheviks well in the fall when the soviet system took on new vigor. 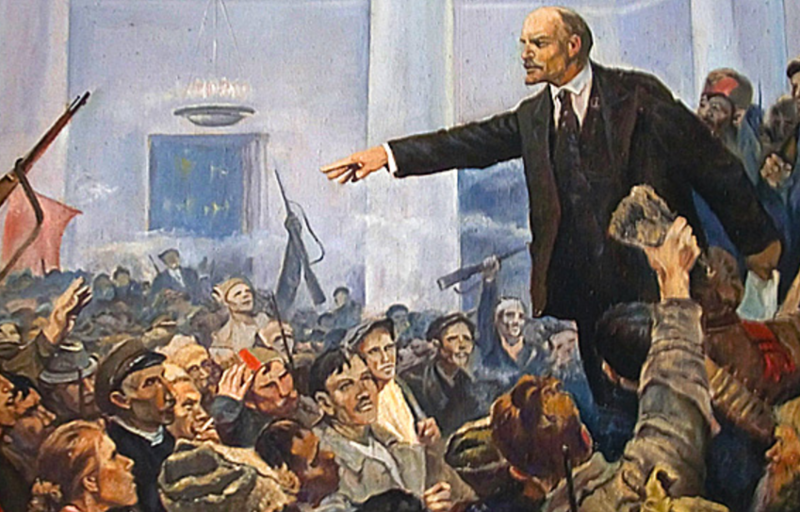 As this episode shows, Lenin was an effective leader because he was a member of a team that corrected individual misapprehensions. Looking past the drama of Lenin haranguing his fellow Bolsheviks in October to carry out an uprising, we should focus on his central argument: the soviet constituency nationwide, peasants as well as workers, had rejected any sort of agreementism and therefore had de facto declared for full soviet power. The armed uprising was no doubt a good idea, but the uprising did not itself create soviet power — instead, it protected the Second Congress and its capacity to turn the unwritten constitution into a written one. Lenin was the strong leader of a united party. But the party was not united because he was a strong leader — rather, he was a strong leader because the party was united around the basic strategy of socialist leadership in establishing a worker-peasant vlast. Looking back on the course of events from February to October, one is struck by the improbability as well as the inevitability of soviet power. October was only possible because of the confluence of three highly unusual circumstances: the utter collapse of the former vlast, the creation of an institution based on workers and peasant soldiers that immediately won the effective loyalty of the army, and the existence of an underground party with a national structure and a ready-to-go program that responded to the first two circumstances. All these features became evident within hours of the fall of the tsarist government. After that, October seems almost inevitable. Agreementism was a dead end, given the profound chasm between the aspirations of the Russian people and those of elite society. Once this became apparent, the Bolsheviks and their program of full soviet power were the only alternative left open for the soviet constituency. Even the counterrevolution was not a real alternative, since it was not yet ready to take power in order to repress the soviets. 1917 was thus a year of clarification about the stakes of the battle. The worker-peasant vlast created in 1917 survived the civil war that followed, but it paid a heavy price. One casualty was the complete abolition of political freedom, even though this had been a central prewar goal of the Bolsheviks. Nevertheless, early Soviet Russia can accurately be described as a “worker-peasant vlast” in several crucial aspects. The whole stratum of landowners had been liquidated as a class, the former educated elite was completely barred from power, the new government institutions were increasingly staffed by workers and peasants, many of the policies of the new government were aimed at gaining support from these classes (for example, mass literacy campaigns), and the workers and peasants were celebrated continually in song and story. Even massive political intolerance was in some ways a “democratic” feature, insofar as it reflected widespread popular values. The soviet power that was created in February 1917 and was preserved in October by accepting Bolshevik leadership established itself as a mighty force in the world, for good and for ill.
Lars T. Lih is an scholar who lives in Montreal. His books include Bread and Authority in Russia, 1914–1921 and Lenin Rediscovered: “What is to be Done?” in Context.